In order to send broadcasts (messages) in SchoolMessenger, you must first create a list of contacts (build an audience) whom you'd like to have SchoolMessenger send broadcasts (messages) to. Click the button that appears in the upper right of the My Lists section. **Hint: Give your new list a meaningful name that will help you easily and accurately identify its recipients. For lists that will contain large quantities of contacts, begin your list name with the word “All”, because lists are sorted alpha-numerically, so lists that begin with “All” will automatically be at the top of the screen making them easy to find. Mark "Contacts": If you want the message to only go to the contacts you've selected themselves. Note that in situations where the contacts you select includes students and those students have one or more "Guardians" related to them (i.e. their Mother, Father, Foster Parent), this setting forces the message to only go to the student themselves, and not also to the "Guardians" that are related to the student, unless you select guardians separately from students in later steps. Mark "Associated Guardians": If and only if you want just the Guardians (parents) of the contacts that you select to get messages when your list is used. See note below. **Note: Using either the option above or below, displays the "Guardian Category Restriction" list which can be used to narrow down the list of "Guardians" that receive the message, to target only Guardian with specific relationships to each contact in your list. Do this by first checking the "Restrict to these categories" checkbox, and then by checking applicable relationships from the list below. For example: A list that will be used to send a message that contains only general information can be configured to be sent to just the primary guardians only (i.e. check just Mother and Father), while a list that will be used to send more urgent notifications can be configured to be sent to more relationship types, and for lists that will be used to send emergency notifications, you might choose to check all boxes (or leave all unchecked) to ensure that all of the guardians regardless of their relationship receive the message. Mark "Both": If you want the message to go to both the contacts you've selected themselves (disregards if the contact is a student or not), and also to the guardians that might happen to be related to the contact if any (happens in situations where the contacts you're including are students). See note above. Use this option to manually add individual contacts into the list that aren’t already in your Address Book and aren't already in the Districts Address Book. After clicking Enter Contacts, you’re brought to the Address Book Editor. Here, enter the new contact’s information by completing the fields and selecting which message types each number and email address will receive. Once complete, click Done. This feature allows you to also save the contacts to your personal SchoolMessenger Address Book for future use assuming the contacts aren't already there. The quickest and easiest way to build a list is using Rules, which allows you to select recipients based on specific criteria (e.g. their grade level, gender, first and last name) which can include special clauses (i.e. is, is not) to help include or exclude specific individuals if needed. You can add and remove as many rules as your need to your list at anytime. The following is a description of what each "Search Option" allows you to do. Use this option find the contacts in the District Address Book when you're not sure exactly what you're looking for. Do this simply by selecting this option and then by scrolling through the list of contact records that appear. 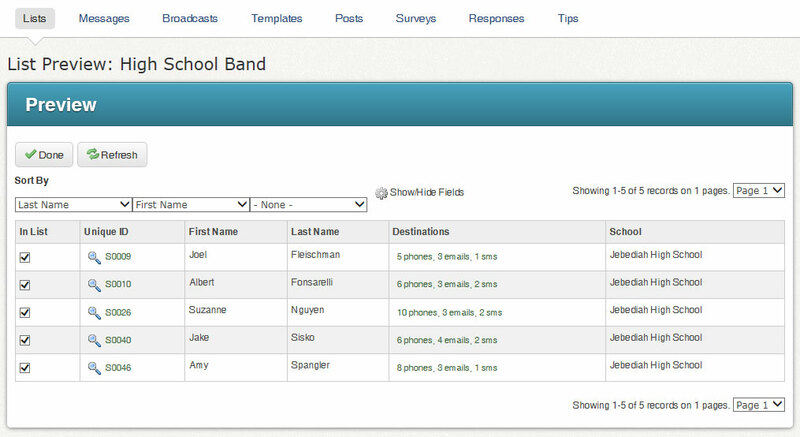 You also have the option of sorting the list and selecting which data fields appear. If a school has registered specific course codes, you have the option of searching by section. Note: If your uploaded list includes contacts that are not in your contact database, note that the contact info will not be added as new contacts in the contact data for your account. So, if you’d like to add the same contacts to another list, you will not be able to search for these contacts as they have not been added to your district account’s contacts. System Administrators use the Data Import feature to add contact data files to the district account. The import generates a unique ID# for each contact. These are the ID#s you would use if uploading a list using ID#s. For more information on this topic, click here. This process is detailed more closely in the Upload List page of this guide. Note: You can only use one search option at a time. Clicking a new search option erases the Search Results from the previous search. You’ll generate a Search Results section below the Search Options section. Select individual contacts to add to your list by clicking the box to the left of their names. After you have finished checking off all the contacts you need, you must click the button above the results in the "Search Options" section. You will then be returned to the List Editor and your total contact count should reflect any additions. The "Search Results" feature includes all Contacts/Students and Staff who have been imported into your account. · Sort By: Use the three drop-down menus to create a sorting priority to help you locate your desired contacts. Combine them to further narrow down your search. · Show/Hide Fields: Used to add or remove other fields within the grid view on the screen to even further help you narrow down to your desired contacts. · Pages: Remember that only 100 records can be displayed on this screen at one time - you may need to change to another page to continue searching for your desired contacts. Note: When searching via the "Show All Contacts" option, any contacts you have already selected by "Rules" will automatically appear with a check-mark in front of their record. After adding recipients using the Additional List Tools, their names will appear in the List Editor in a new “LIST ADD/SKIP” section. You have the option of removing these list additions from the List Editor page. Once you have finished selecting all the contacts needed to create your list, and have targeted the appropriate recipients, click on the button at the bottom of the List Editor. You will be returned to the List Builder screen and will see your list has now been saved in "My Lists". Any lists appearing in the My Lists section will be available to instantly select when setting up a Broadcast. You will also find the options to "Edit", "Preview", "Publish" or "Delete" lists. Note: For lists to which you have subscribed, the only options that will be available are "Preview" and "Un-Subscribe". You cannot make edits or delete lists which were created by other users. Our first rule would be to only pull contacts in the 10th grade. The next rule would be to select a specific gender (female). You can narrow the criteria even more by searching for 10th grade students in a specific school or subject by continuing to add more rules. Note: Once you select a field as a rule, you can’t select it again to add a new rule in the same list. What you can do is create a new, separate list. If all you need is that one rule to accurately select the contacts you need, you can move on to the Target Recipients instructions. 1. Use the "Field" menu to select a new value. 2. Select the appropriate "Criteria": "equals" to get an exact match, "does not equal" to get all records except those with a specific value... or use "contains" when a field could contain more than one entry. 3. Once all your rule settings are correct, click "Add". You can review your selected recipients by reviewing the Total number and by clicking the button. You can delete individual contact records within the list preview by removing the check to the left of their data record.